Pectus excavatum(PE) is an indentation of the chest. Other names include funnel chest, or concave chest. PE is the most common deformity of the chest wall and is seen in up to 1.0 % of the population. PE is more common in men, and is more prominent in thin individuals. In our experience, males often spend years doing pectoral building exercises to improve the appearance. Unfortunately, this frequently makes the concavity more prominent and can therefore be a significant source of frustration. At Osler, we also have a vast experience treating women with PE. We have seen some individuals seek help from plastic surgeons who inappropriately suggest breast enhancements using implants to improve the appearance. Not only does this make the defect worse, it makes future repair using the Nuss procedure more difficult. After breast implants, the surgical field becomes scarred and the chest wall stiffens, making the surgery more challenging , and placing more pressure on the Nuss bar. Breast enhancement can still be performed after the Nuss procedure. How is the Severity of Pectus Excavatum Measured? 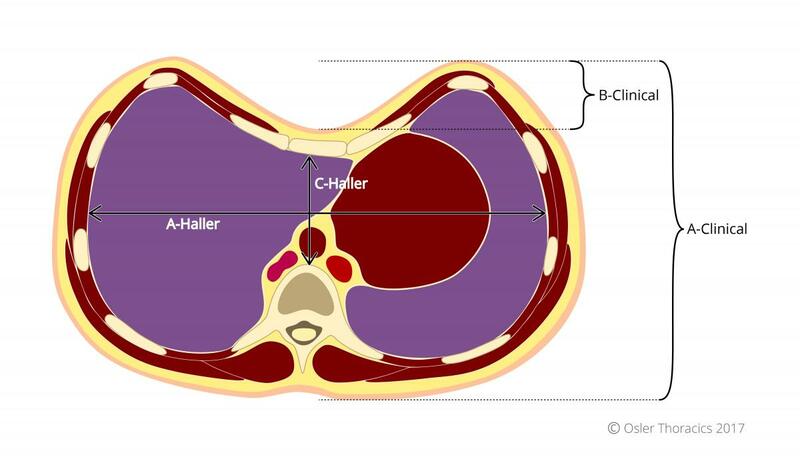 The Haller index is most frequently calculated using CT measurements of the internal transverse diameter of the thorax measured between the inside of the rib cage, divided by the shortest anteroposterior depth as measured from the internal aspect of the sternum to the anterior cortex of the closest vertebral body. This is done during expiration. An index >3.1 warrants repair if the patient is symptomatic. The Anthropometric Index can be easily calculated in the office while the HI requires a CT scan. At Osler we prefer not to unnecessarily expose patients to radiation from a CT scan to simply grade the severity of the PE. We feel a physical exam with simple bedside measurements provide adequate information to guide clinical care. The AI is calculated while the patient lies flat on their back on an exam table. The physician measures the depth of the chest (A-Clinical, in the above image), and the depth of the PE deformity, B-Clinical. The AI is equal to the depth of the pectus depression divided by the depth of the chest. An AI of greater than 0.12 is equivalent to a Haller Index of 3.1, the threshold used as an indication for surgery. In the United States, insurance companies require quantification of the PE to approve the surgery. Fortunately in Canada, the decision to offer surgery is at the discretion of the clinician. Mild pectus excavatum is treated with exercise and a possible brace. Moderate and severe deformities are candidates for surgical repair. Until recently, most thoracic surgeons stated that a pectus abnormality was merely a cosmetic issue. Many patients were dismissed by their doctors. As a result, people frequently went untreated. In many cases, however, the condition can compromise heart function, especially during exercise or exertion. The heart sits underneath the depressed sternum, and may be compressed by this deformity. This prevents blood from flowing easily into the heart, and explains the shortness of breath many patients experience in moderate to severe PE. Evidence suggests that these physiological impairments may get worse as the patient ages. Data shows that individuals with PE have improved cardiopulmonary function after PE repair, as well as having improved body image, self-esteem, and marked improvement in psychosocial function. More recent consensus by thoracic surgical communities supports the surgical repair of moderate to severe cases of PE, and contradicts previous arguments that the repair of PE is primarily cosmetic. The bar is left in place for 3 years while the anterior chest wall remodels and heals. More than 85% of patients describe their cosmetic results as good to excellent. This procedure has rapidly gained popularity because of the small skin incisions required and shorter operative times. William Osler Health System has been treating patients suffering from Pectus Excavatum (PE) for over 7 years. We focus primarily on adult patients. Our pediatric patients are referred to Dr. Peter Fitzgerald at McMaster University. Dr. Fitzgerald, a pediatric surgeon, was instrumental in our initial experience at Osler. His expertise allowed us to train our surgeons and staff. Over the past 7 years we have gained a tremendous amount of expertise on the unique care of adults suffering from PE. 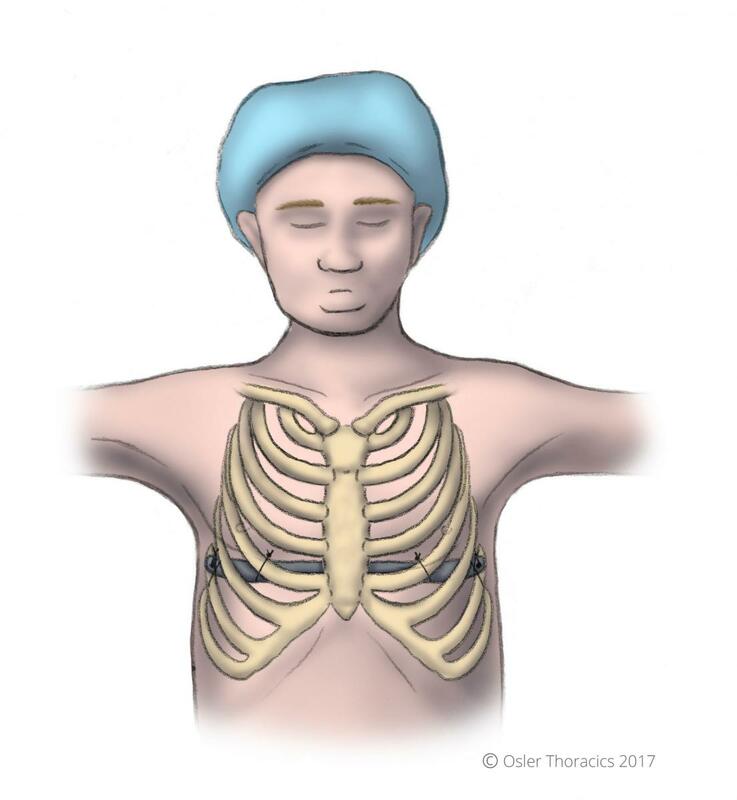 Although the Nuss procedure was primarily intended for the pediatric population, it has now become the gold standard for PE repair in adults despite the fact that the adult chest wall is less malleable. It is a safe procedure performed using a video-assisted approach. Despite the small incisions, the procedure can be painful. At Osler we use an epidural for pain-control and have a dedicated team that manages post-operative pain, and patients are typically on narcotics for 3-4 weeks post-op. Bar displacement: A poorly secured bar can move easily. Securing the bar to the chest wall is probably the most critical part of the operation. If the bar displaces or even flips the patient may require another procedure. Another surgery to remove the bar: Although the bar has to be remove in 3 years, this procedure is simple and well tolerated; at Osler it is performed as an outpatient. Asymmetry: The Nuss procedure elevates the sternum with the hope that the joint between the cartilaginous and bony part of the rib will become normal. Unfortunately, especially in adults, this joint may remain somewhat concave, leading to flaring of the ribs and possible scalloping of the lateral chest wall. At Osler, our clinical assessments are often enough to proceed with treating PE. You may be required to have a CT scan, or have a heart echocardiogram done. An echocardiogram is a simple test that uses ultrasound to create pictures of the heart and assess heart structure and function. After your initial assessment, your thoracic surgeon will have a discussion with you about whether surgical repair of PE is recommended. If both you and the thoracic surgeon agree to proceed with surgery, the operation date will be booked. You will also have a detailed discussion with your surgeon about the risks and benefits of the Nuss procedure. This is a great opportunity to ask as many questions as you want. After your surgery, you will usually recover in hospital for about 3-4 days. Despite the small incisions required for the Nuss procedure, it can be quite painful post-op. At Osler we use an epidural for pain-control, and have a dedicated team that manages post-operative pain. Patients frequently require narcotics for about 3-4 weeks following the procedure. After the surgery, you may have a catheter in place to reduce the need for movement, and because the epidural used during surgery can interfere with your ability to control your bladder. You will also be helped with any movements necessary especially in the day after your surgery. This is to help avoid unnecessary strain that could displace the bar. Your physician will tell you which physical activities you should avoid during recovery. Prior to starting any exercises and activities, it is important that your pain is also controlled. Take your pain medication according to your doctor’s prescription, and follow your doctor’s instructions on what activities you can and cannot do. CPR can be performed if necessary as well as defibrillation. You will be given an application for a medical alert bracelet at discharge. No MRI’s of the chest and thorax can be done, but CT scans are recommended. You should be walking at least once daily. Slowly increase the distance as tolerated. No backpacks for 3 months. Have someone assist you for the first two weeks to sit up by putting their arm behind your back, bringing you into long sitting position. Move your legs slowly around to edge of bed, making sure not to twist or bend your back. Do not push/pull with your arms. No log rolling, and no lying on your side or stomach. In a relaxed position, place one hand on the upper part of your abdomen, just below your rib cage. Slowly breathe out as much as you can, allow your abdomen to sink inwards. Now breathe in and you should feel your abdomen expand into your hand. Do this exercise 10 times every waking hour followed by 2-3 coughs to clear any phlegm. Continue the breathing exercise as long as you produce phlegm from your lungs. Clasp your hands together and lift your arms above your head (either lying down or sitting). Keep your elbows as straight as possible. Repeat 5 times. Do 3 sessions of this exercise per day until you are able to achieve full, pain-free range of motion. Avoid slouching while sitting and standing. Standing facing a mirror, make sure your shoulders and hips are level and your head is not tilted. From the side view, your ears, shoulders, and hips should be aligned. Remember to stand tall. When you are sitting, sit in a high back chair and straighten your back with your buttocks, shoulders and head touching the back of the chair. You may shower on the 6th day after surgery, and you can let the water run over your incision. Carefully pat the incision dry with a towel. The paper band-aids (Steri-Strips™) on the incisions will slowly come off as you shower and can be completely removed at 7-10 days. Avoid baths until all of your incisions are completely healed. Also avoid lotions or creams on the incisions until they are completely healed. You will be off for 3-8 weeks. If your work involves (strenuous) physical activity, you may have to wait longer before returning to work. Check with your doctor before returning to work or school. You should not drive until you have stopped taking prescription pain medication, since the pain medicine may make you drowsy. This will usually be 2-3 weeks post-op. Check with your doctor before you begin driving again. high velocity sports such as karate, snowboarding, gymnastics, hockey, etc. for 3 months. Avoid twisting and bending of the back for 3 months. You can bend at the hips only. Check with your doctor before participating in any physical activities, even if you have no pain. You may travel by air after 2 weeks. Please check with your doctor. You will need to sleep on your back for the first 4 weeks after surgery. No side lying or lying on your stomach. After a Nuss procedure you will have small white dressings over each incision on the sides of your chest. These dressings may be removed 48 hours (2 days) after the operation. The paper band-aids (Steri-Strips™) on the incisions will slowly come off with time but can be completely removed at 7-10 days. Avoid baths until all of your incisions are completely healed. Also avoid lotions or creams on the incision until it is completely healed. Recovery from the Nuss procedure can be quite painful. During your stay post-op in hospital, we use an epidural for pain-control, and have a dedicated team that manages post-operative pain. At home, patients frequently require narcotics for about 3-4 weeks following the procedure; please follow your surgeon’s instruction on the medication(s) you’re prescribed. Contact your surgeon’s office if your medication is not properly managing your pain. Three years after your Nuss procedure, you’ll need another surgery to remove the bar. This procedure is usually simple, and at Osler it is performed as an outpatient basis—this means you’re in and out in a single day! After having the Nuss bar removed, patients typically need 3-4 days off school or work.